A photo from The People of India, published from 1868 to the early 1870s by W. H. Allen Ltd, for the India Office. 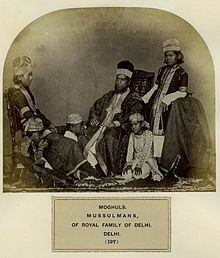 The Mughals (Persian: مغول‎; Urdu: مغل‎; Arabic: مغول‎, also spelled Moghul or Mogul) are a number of culturally related clans of the Indian subcontinent. They are descended from the various Central Asian Mongolic tribes that settled in the region. The term Mughal (or Mughul in Persian) literally means Mongolian. During the time of the Mongol Empire in the 13–14th century, the army of Genghis Khan swept across Central Asia and into Persia. Over subsequent centuries, descendants of these soldiers inter-married with Persian and Turkish Muslims, converted to Islam, and adopted the Persian language and culture. Conflict between India and the Mongols has been recorded from the time of Genghis Khan to Timur to Babur. The Delhi Sultanate (1206–1526) faced nearly annual Mongol onslaughts from 1297 to 1303 when the Doab was sacked, and what is now Pakistan was under continual Mongol occupation. Indian and Indo-Persian sources referred to the invaders as Mughal, derived from Mongol. During the 16th century, the Turko-Mongol conqueror Babur brought most of northern India under Mughal rule, establishing an empire that would endure until the mid-19th century. As the ruling class, the Mughals lived mainly in cities along with other Muslims. They were traditionally known for their skill at horsemanship, archery, wrestling, and a meat-heavy diet. ^ a b Dictionary Of Geography. Wisconsin: Houghton Mifflin. 1997. ISBN 0-395-86448-8. ^ Liz Wyse and Caroline Lucas (1997). Atlas Of World History. Scotland: Geddes & Grosset. ^ Collins Compact Dictionary. Glasgow: HarperCollins. 2002. ISBN 0-00-710984-9. ^ John Keay (2000). India: A History. New Delhi: HarperCollins. ISBN 0-00-255717-7.